So I've come to the conclusion that most of us are completely disconnected from our food. What I mean is, I don't think we realize what our 'food' goes through to get from wherever it came from, into whatever it is processed into, to wherever we buy it. Gone are the days of eating seasonal fruits and veggies grown locally by community farmers. Today, our food comes from all over the world and most of us don't even realize the energy it takes to get it here. While visiting Lee's parents this summer in Edmonton, AB, I had the pleasure of eating fruits and veggies straight from Lee's mom's garden. I'd never seen a potato pulled from the ground and then to cook it and eat it fresh that evening was a life-changing experience. Right then and there I vowed to someday have a garden of my own where I can grow and eat things from the earth in my own backyard. Until then, I have the Santa Monica Farmer's Market. I truly am so lucky to live in Santa Monica for many reasons. The beach, the pier, the sunny weather (although I am SO sick of it), but most of all, I have the bi-weekly farmer's market. On Wednesdays and Saturdays the farmer's market takes over the streets of Santa Monica with local wares such as fresh fruits, veggies, fish, eggs, baked goods, flowers, plants, and so much more. Nothing is more satisfying than looking the farmer in the eyes that, the day before, picked the fruit or vegetable that I am buying. It feels so great to be buying locally grown produce from local farmers who rely on these farmer's markets to make their living. I feel connected to my food and my community, which is virtually impossible when shopping at large chain grocery stores. Who knows when that apple or that carrot was picked that is sitting amongst the other glossy and waxed fruit?!? And bananas? Don't even get me started. What is so funny to me is how spoiled and selfish we have become as a society. When was the last time you actually thought about the seasonal calendar of when fruits and vegetables are meant to be had? A tomato in January? Grapes in March? I bet most of those things weren't even grown on this continent at that time of year. The amount of energy it takes for grapes to be grown in Chile (which is the California growing equivalent for fruits/veggies from Jan-April) and then to be shipped in a pre-ripened state, then trucked from the ports to your grocery store is mind-boggling. And then it all makes sense why you're paying $5.99 a pound for fruit at that time of year because of the sheer cost of getting it to you! I am not suggesting that you stop eating fresh fruits and vegetables that aren't in 'season' during the winter months, although it is more energy-conscious and environmentally friendly. I just think people, in general, need to be more aware of what their food goes through to make it on their plate. Since most of my friends are descendants of pioneers, I encourage you to think about what our ancestors did during the long winter months when fresh vegetables and fruit were a distant dream. They planned ahead and canned things that then could be enjoyed throughout the year. I know it's a bit far-fetched to think that any of us are going to go to the extreme of living like pioneers but I don't think it's a bad thing to take life back to a simpler time, when food was actually thought of as more than just something to fill the stomach. Two books that put me on this soap box are "Animal, Vegetable, Miracle" by Barbara Kingslover and "The Omnivore's Dilemma" by Michael Pollan. Both are great books that will get you thinking about your food and how special it truly is and can be if not taken for granted. I took this picture last week at the farmer's market down the street from where I live. 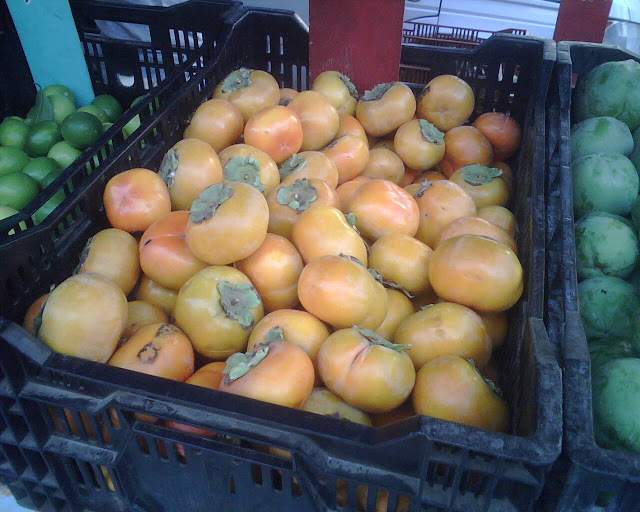 It's that time of year when persimmons are in season. Last week when I was walking down the aisles of fresh, locally grown produce, I almost shrieked when I saw these dark orange globes. These little gems are only in season from late October to mid January and when they are, I eat at least two a day. I look forward to this time of year because I absolutely love persimmons and it makes life a little more exciting (at least to me) and a little more sweet having to wait for this particular fruit rather than having it abundant (and shipped out-of-season) year-round. ...I'm ready to go back to a simpler life. And when I have my garden, all of you are invited over for a home-cooked, fresh-from-the-garden meal. I completely agree. The farmer's market in Salt Lake gets bigger and better each summer, but that's the problem, I can only enjoy the market from June-October. This summer I really enjoyed buying the majority of our produce and herbs from the farmers at the market. Let's keep our farmers in business, I say! I want to read the two books you mentioned, I'm in need of a good read. Amen, so well put! I sure like reading all that you have to say. Keep it up!